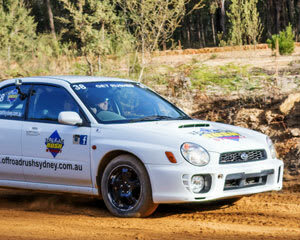 How would you like to get behind the wheel of a Turbo WRX Rally Car? Well what are you waiting for? Set the dust flying with 8 laps where YOU DRIVE plus one flat out HOT LAP in the passenger seat. The Adrenalin will start to pump as you pull on your helmet before getting into this classic rally car. Now you look the part so you better act it too - you will be taught the special techniques for handling a rally car on a dirt track and will be in constant communication with the pro in the passenger seat to make sure you get the most out of your drive time. Then, when you think you've mastered rally driving we strap you into the passenger seat and let the pro take the wheel for one awesome Hot Lap. Great day, everyone loved it. Fantastic day supported by fantastic people! The instructors and staff at the Sydney Off Road Rush were great value and I'll definitely be recommending them to anyone who might be interested! Absolutely LOVED this experience. Couldn't speak highly enough of the helpfulness and enthusiasm of staff. We had a group of three on the day. I am terrible with manual and they calmly taught me allowing me to gain still a thrilling experience. The others I went with were more skilled, and staff catered their drives also accordingly, to include more skill based training. Wonderful day!!! !